These bosses rotate weekly and appear at the end of Level 7, each with their own unique mechanics. Escalation Protocol has been a hot topic since the release of Warmind—we’ve been tracking feedback ranging from difficulty to fireteam size. Design Lead Jacob Benton and Design Lead Ben Wommack are making some changes to the experience. Jacob/Ben: The moment this weekly update goes live, the Power levels for Escalation Protocol enemies will be lowered in waves 4–7. Waves 1–3 are unchanged and will remain at 370 Power (so still watch out for that level 2 Wizard boss). NOTE: To avoid matching into an area that has been running since before the change, wait a short time after this update before landing on Mars again to attempt Escalation Protocol. Normally changing enemy Power levels requires a patch, but during development, we created unique server flags which can flip between two sets of Power levels for all Escalation Protocol enemies. These were created in the wake of the community summit, when we decided to make the activity even more difficult. The flags don’t require any download from you to flip, which is how we can enact this change so quickly. We’ve been looking at our internal data while listening to all of your feedback about Escalation Protocol since the launch of Warmind. Reading these stats, not as many players are attempting Escalation Protocol with a fireteam of three as our designs intended, mostly because of how difficult waves 6 and 7 are. Tweaking the difficulty of waves 6 and 7 very quickly through Power level changes is something we can do right away because of the server flags mentioned above, rather than waiting a number of weeks to deliver a patch. By reducing the Power levels of the latter waves, we are intending to make Escalation Protocol more approachable for players who want to try the activity at 385 as a fireteam of three with potential help from others in the world. Getting nine players into the same space will still be possible, but for those at or close to max level, it shouldn’t feel as necessary as before. If anyone is worried that we’re nerfing this activity into the ground, rest assured that it will still be a highly difficult end-game experience. All the mechanics, timers, and enemy behaviors will remain unchanged, so you should still plan to bring your best team, gear, and strategies to succeed. Escalation Protocol rewards are split up in to 3 main channels: vanity, weapons, and armor. Each channel operates a little bit different to give people different pursuits and provide rewards at different rates/tiers. I think the diversity of this reward delivery is something we haven’t done a lot of in Destiny 2, so I’m super curious how it feels once you get your hands on it. That aside, let’s jump in! Vanity: These rewards are low drop chance, and can come out of any Escalation Protocol chest you open during the event. The further in you get, the higher chance the chest has to grant one of the EP exclusive vanity items. However, even if you can only clear up to wave 3 (the first wave that spawns a chest upon completion) then you can get a chance (admittedly very low…) at getting one of the vanity items. EP has an exclusive Ship, Sparrow, and Ghost. Weapons: These are your grindable rewards. They don’t drop as power upgrades past the soft cap (so you’ll want to infuse something in to them if you’re past 340) but you can spend as much time chasing them in a week as you want. They’re a low drop chance from the wave 7 boss, and the reward pool changes for the different bosses. Three of the bosses have a specific weapon (between shotgun, sniper rifle, and smg) tied to them and will only drop that weapon. The other two bosses can drop any of the three weapons if you just want to grind and roll the dice. I should note that while not really part of one of the three main reward channels, the unique Escalation Protocol shader is one of my personal favorites (because I love orange) and comes from killing the final boss. Hope this clears up any confusion, and let me know if there are any other questions about EP rewards I can hopefully help with. Escalation Protocol is a player-initiated Destiny 2 activity that can only be found on Mars. Players that successfully complete all of the progressively more difficult levels of the activity will face a prestige-level boss encounter that rotates weekly. 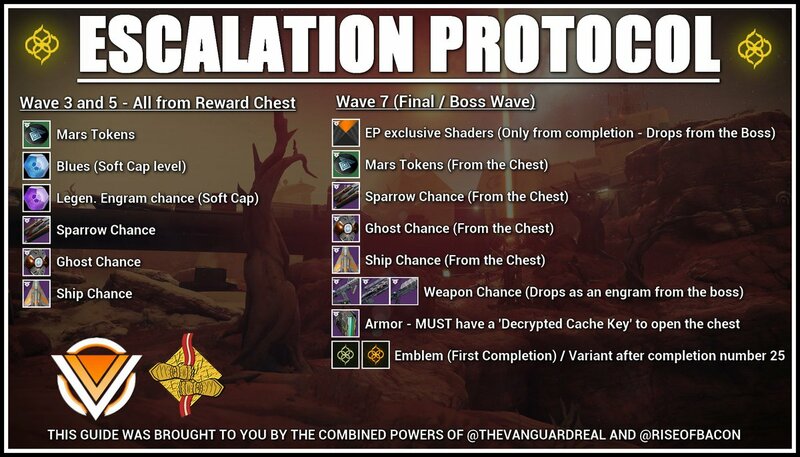 For more information on Escalation Protocol, please see below. 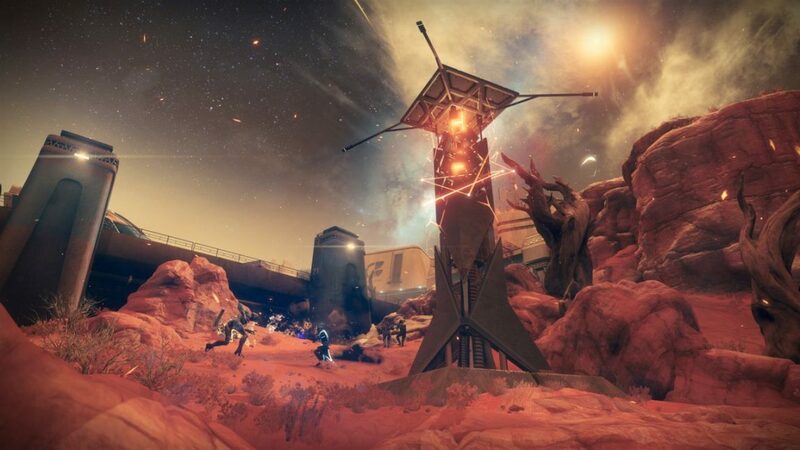 Players can initiate Escalation Protocol by interacting with the bunkered towers located throughout Mars. Escalation Protocol may not be available to initiate if a Public Event is active in the same area. Once Escalation Protocol has been initiated, a large tower will rise up and start the first level of the activity. Each level is timed and may contain several waves of enemies, mini-events, and mini-bosses. After successfully completing a level, one of the participating players will need to locate and activate the next raised tower before the timer runs out. On the final level, players will encounter the week’s final boss which will drop a loot chest if successfully defeated. The final boss of the Escalation Protocol activity rotates every week and changes at the Weekly Reset. If the participating players fail to complete a level, they can restart the Escalation Protocol immediately. If players failed at the first two levels, the activity will start over at the first level. If players fail one of the higher levels, they have 60 seconds to restart the activity which will allow them to start at the beginning of the last successfully completed level (i.e. players that fail level 4 will restart again at level 3). If players fail a restarted level, they will have 60 seconds to restart the activity which will allow them to start at the beginning of the next lower level (i.e. players that fail level 4, restart at level 3, and then fail level 3 will restart again at level 2). As mentioned above, Public Events cannot be active during the first level of Escalation Protocol. Incoming Public Events can interact with an active Escalation Protocol to create a more challenging experience. Successfully completing an Escalation Protocol level, will allow the incoming Public Event to be integrated into the next level. Players must complete the Heroic version of an integrated Public Event and defeat all of the Escalation Protocol level’s bosses to be counted as a victory. If a Public Event is pending and players fail the first two levels of Escalation Protocol, the Public Event will launch immediately as a normal Public Event. If a Public Event is pending and players fail a higher level of Escalation Protocol, the Public Event will be delayed for the duration of the 60 second activity restart timer described above. Players cannot use Rasputin Armory Codes during levels with an integrated Public Event. Public Events cannot launch or be active during the final level of an Escalation Protocol activity. Players may earn rewards from participating in Escalation Protocol, including rewards exclusive to the activity. Players have a chance to earn exclusive rewards for completing the third and fifth Escalation Protocol levels. Successfully defeating the final boss will spawn a loot chest and may also drop some additional exclusive rewards. All Escalation Protocol loot chests will spawn at the tower that was active during that level. The loot chest from the final boss requires a Decrypted Cache Key and will reward players with exclusive Escalation Protocol armor and cosmetics. The Escalation Protocol armor rewards will be granted for the character class that opened the chest. The armor rewards are guaranteed to be an armor piece that the character has not yet received until all pieces of that class set have been acquired. A Decrypted Cache Key is needed to open the loot chest from the final boss of Escalation Protocol. After completing the Warmind campaign, players will begin receiving Rasputin Key Fragments from the following sources: Heroic Adventures, Heroic Strikes, Nightfall Strikes, and the Raid or Raid Lairs. Once per week, players can turn in their collected Rasputin Key Fragments to receive an Encrypted Cache Key. Players must complete Escalation Protocol levels to turn the Encrypted Cache Key into a Decrypted Cache Key. New wraps (Triassic and Dino) in the item shop, swipe to view Dino wrap.